Entrepreneurs and VCs need to be more precise in the way they talk to each other when it comes to fundraising. Put yourself in the shoes of a startup investor. Every day you review entrepreneurs, through a sort of funnel: very wide at the top and narrow down below, with only a few investments coming out the bottom each year. The average venture capital firm reviews approximately 1,200 companies in order to make 10 investments. At Village Capital, we make contact with nearly 10,000 entrepreneurs a year, get to know about 150 of them through our programs, and eventually invest in 15 to 20 startups. This shorthand language is the VC equivalent of those pre-written text messages on your phone — ultimately, it’s no replacement for real communication, and something gets lost in translation every time. Now put yourself in the shoes of an entrepreneur. You build an minimum viable product (MVP) and set up meetings with investors. You take dozens of meetings at coffee shops, bars, and well-lit offices, but keep hearing No. Not only that, you often leave with little in the way of constructive feedback. You want to be able to share news with the investors you met about your progress, and maybe you do, but you don’t know exactly what it would take for an investor to get to Yes. This is all too common: entrepreneurs and investors lack a common language to communicate what they are looking for. As a result, investors rely on shorthand language, which makes the funding process really tough for both sides of the table. In the same way, “early-stage” can mean two different things to two an entrepreneur and an investor, or two different investors. So can “product-market fit”. For that matter, so can “scale”. Over the past several years, our team at Village Capital has worked with hundreds of entrepreneurs and investors to solve the “Color Blue” problem. What does an investor mean when they say “product-market fit,” “value proposition,” or “scale?” And how can we use these definitions to best match entrepreneurs to investors at the proper stage? The framework, which we call the VIRAL (Venture Investment-Readiness and Awareness Levels) Pathway, helps entrepreneurs and investors use the same language at the top of the funnel. VIRAL helps entrepreneurs become self aware and articulate just how ready they are for investment. It allows investors to communicate the point at which they want to invest. We’ve found it a helpful lingua franca to kick off — and sustain — entrepreneur-investor conversations. When the top of the funnel is clear and transparent, all entrepreneurs can get a fair shot, and investors are better able to find the best ideas. In developing this framework, we took pointers from NASA, which experienced a similar problem in evaluating the level of maturity of technologies. (Steve Blank also developed a startup framework based on NASA’s model) The secret sauce is precision. NASA ranks the level of maturity of a technology from 1 to 9 to avoid confusion about the stage of the technology’s development: instead of saying “early-stage technology” or “late-stage” technology, they say “Level 3” or “Level 9”. Read more NASA coverage on TechCo. 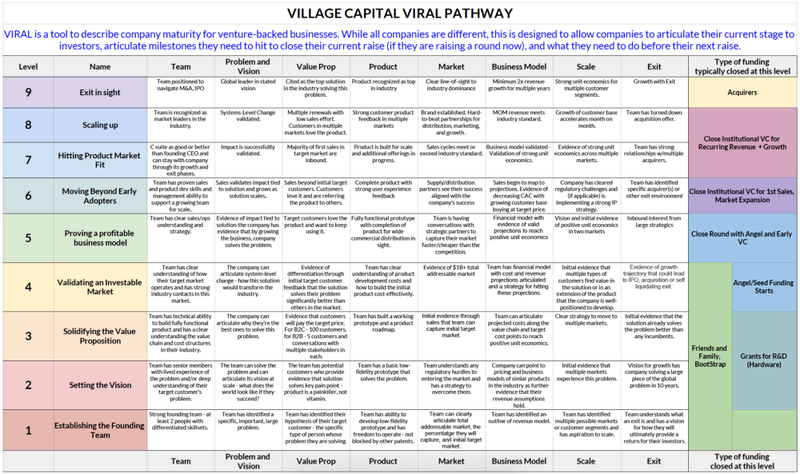 Village Capital’s VIRAL Pathway. © Village Capital 2017 (click to enlarge image). To many investors, product-market fit is a very advanced stage. It means that a company’s inbound requests have exceeded outbound sales. It means a company is so good that it’s growing without having to try very hard – which makes sense why investors like this. It give them the sense of less risks in their investment. An entrepreneur might understand the term differently. Let’s take an entrepreneur, Jane, who is selling the same product to multiple customers and getting great feedback. 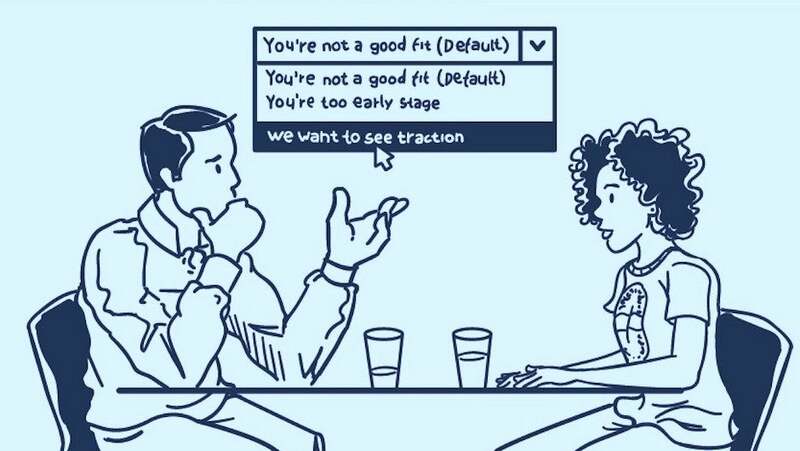 Jane might look at her progress and tell herself, “We’ve reached product-market fit — now it’s time to talk to venture capitalists.” When Jane meets the investor, she’ll receive a hard No, rather than having a productive conversation about what product-market fit looks like. 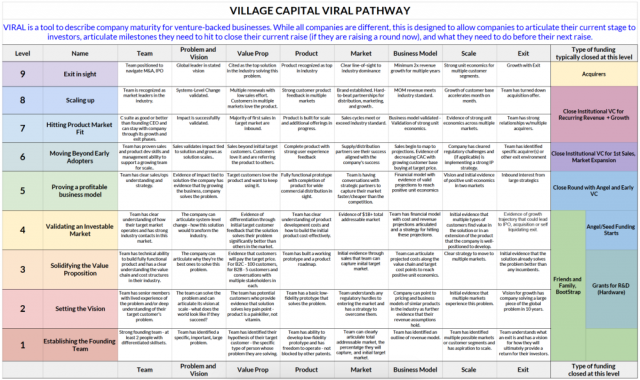 Jane is at VIRAL Level 3, while an entrepreneur that has achieved true product-market fit would be at VIRAL level 7. It’s important to note that a Level 3 company is not worse than a Level 7 company. The company is just at a different level of investment-readiness. Many types of investors (such as angel investors) prefer Level 3 companies because they require smaller capital amounts and provide greater potential upside at lower valuations. But venture capital firms rarely invest before Level 7. We originally developed VIRAL for our own internal use, and have been using it during our investment-readiness programs at Village Capital for the past several years. We first developed it as a framework to help us internally, but companies started using it as a tool. We’ve also been working with investors to use VIRAL to manage the top of their funnel. NRV, a fantastic regional venture fund in Richmond, Virginia, has started to do an initial VIRAL diagnosis of companies that initially contact them for investment. Instead of “We love you, but you’re too early stage,” they can provide feedback in the context of the VIRAL framework, highlighting where the company is, and where NRV invests. When these entrepreneurs do become investment ready, you can bet NRV will be their first call. We’ve also been using VIRAL to help organize ecosystems. We recently worked with U.S. Senator Mark Warner and Virginia Secretary of Technology Karen Jackson to help map the entire investor community in Virginia, based on what VIRAL level (or levels) each investor focuses on. Once the project is finalized, entrepreneurs will be able to see how the entire ecosystem is organized and who they should be speaking with, whether they are a Level 3 or a Level 7. While the VIRAL framework is not going to solve all communications problems between entrepreneurs and investors, it can help. Read more funding tips on TechCo. Editor’s Note: This is a modified version of an original article by Ross Baird is President of Village Capital. Bidisha Bhattacharyya is Vice President of Product and Emerging Markets and excellent points of contact if you’re looking to give this VIRAL framework a whirl. Executive Director of Village Capital; also teach at University of Virginia. Enable entrepreneurs to solve major global problems. Big fan of University of Virginia basketball and the MLB Atlanta Braves.